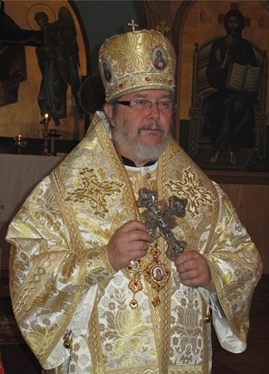 Born in Montréal, Quebec, in 1948, Bishop Irénée received a BA in Slavic Studies from the University of Ottawa in 1971, after which he began studies at Holy Trinity Seminary, Jordanville, NY. He was accepted as a novice at Holy Trinity Monastery and placed under the spiritual guidance of Archimandrite Kiprian. In 1974, he was tonsured a Rassophore monk. The following year, he was tonsured a Stavrophore monk with the name Irénée, in honor of the sainted hieromartyr of Lyons. Bishop Irénée was elected as Bishop of Ottawa and the Archdiocese of Canada by the Holy Synod of Bishops on October 21, 2014. Three weeks earlier, he had been nominated by clergy and lay delegates at the Extraordinary Archdiocesan Assembly held in Gatineau, QC. On on Saturday, November 29, 2014, he was enthroned at Annunciation/Saint Nicholas Cathedral in Ottawa. His Eminence was elevated to the rank of Archbishop during the 2015 Spring Session of the Holy Synod.